Do you ever wish you had more time to work on your podcast? You want to create great content for your audience. 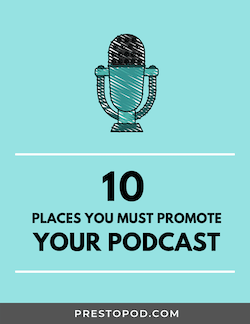 And you’re probably already spending a lot of time planning, producing and promoting your podcast. And if you interview people on your show, then you know just how time consuming it can be sometimes to schedule podcast interviews. You can waste a lot of time going back and forth with your prospective guests, trying to find a date and time that works for you both. In this post, I’m going to show you how you can use Calendly to make it easier for your guests to book an interview and also save you time. Calendly is a scheduling service that integrates with a Google or Office 365 calendar. You get a personalized booking page which you share with your guests. They simply find a date and time when you’re both available and book it. You receive email notification when the booking is made and the appointment is automatically added to your calendar. Signup for a free account at Calendly. After you’ve entered your email address, you’ll be asked to sign up with your Google account. But you don’t have to do this. At the bottom of that screen you’ll see a link that lets you create an account with whatever email account you want to use. This doesn’t have to be the email associated with your calendar. We’ll set that up later. I prefer to create my own account instead of signing up with my Google account. This gives me a little more flexibility with switching to different calendars I want to integrate with. After you’ve entered your email address, name and password, click the ‘Continue’ button and you’ll be sent an email with a confirmation link. Once you’ve clicked the confirmation link in the email that you received, you’ll be asked to provide some basic information such as how you’d like to customize your booking URL that you’ll share with your prospective guests, which timezone you’re in etc. Next, you’ll be asked to connect to your Google or Office 365 calendar. If you don’t want to connect with a calendar, then simply click the ‘I Don’t Need to Connect to My Calendar’ link. Once you’ve completed the initial setup, you’ll arrive at the Calendly dashboard. 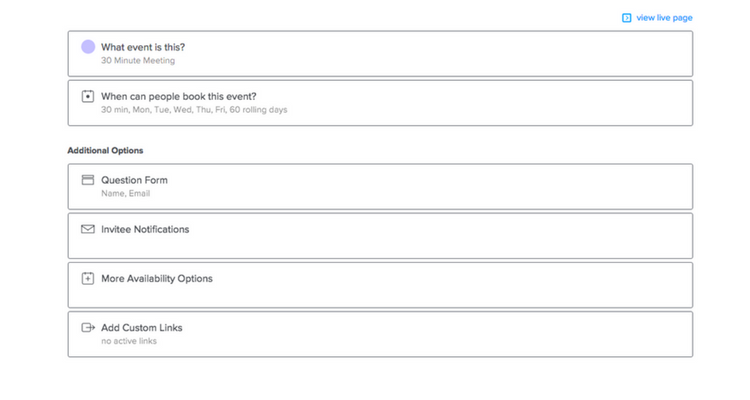 You’ll notice that Calendly has already created a few different event types for you e.g. 15 Minute Meeting, 30 Minute Meeting and 60 Minute Meeting. Let’s customize one of these and turn it into your podcast interview event type. Let’s say you normally schedule 30 minutes for a podcast interview. Click on the ’30 Minute Meeting’ meeting and click ‘Edit’. You’ll now see a page which looks like the one below. There are several settings you can set for your event type. We’ll go through each of them one by one. And then click the “Save and Close” button. Click on the section titled “When can people book this event?” and setup your available hours. Since our podcast interviews are all done on Thursday afternoons, I’ve setup Calendly to only show available times on Thursdays between 2pm and 6pm Pacific time. Click on the section titled “Question Form” and add any questions you’d like to ask your guests when they make the booking. I would suggest keeping this as short and simple as possible. Calendly always asks people for their name and email. In my example below, I’ve added one additional question to request their Skype ID when they make the booking. Click on the section titled “Invitee Notifications” and you can personalize the emails that your guests receive when they make a booking or cancel a booking. Or you can just leave them as they are and use the default emails that Calendly will send out. It’s completely up to you. Click on the section titled “More Availability Options” and you have some more options to customizing your availability. For example, you can set your ‘Minimum Scheduling Notice’ to 24 hours so your guests can’t book an interview on the same day (unless of course you’re okay with that). You can also set a buffer before and/or after your interview e.g. you may want to set the ‘Buffer before event’ to 30 minutes, so you always have some time in your calendar to get ready for the interview, complete last minute sound checks etc. Once you’re done, click the “Save and Close” button. Click on the section titled “Add Custom Links” and you have the option to add links that you want your guests to see on the booking confirmation page. In the example below, I’ve added a link to the interview flow page so guests can see the general flow of the interview, what type of questions will be asked, how long the interview with be etc. All you have to do now is share your Calendly event type link with your guests and they can book the interview with you in minutes. Instead of giving your guests the Calendly link to your booking page, you can embed the calendar on your website. So for example, you could create a page on your site e.g. http:www.example.com/schedule and you could embed your booking calendar on that page. That way, your booking link will be even easier to remember and your guests won’t even have to leave your website to make the booking. Here’s a guide on the Calendly site which shows you how to embed the calendar on your page.